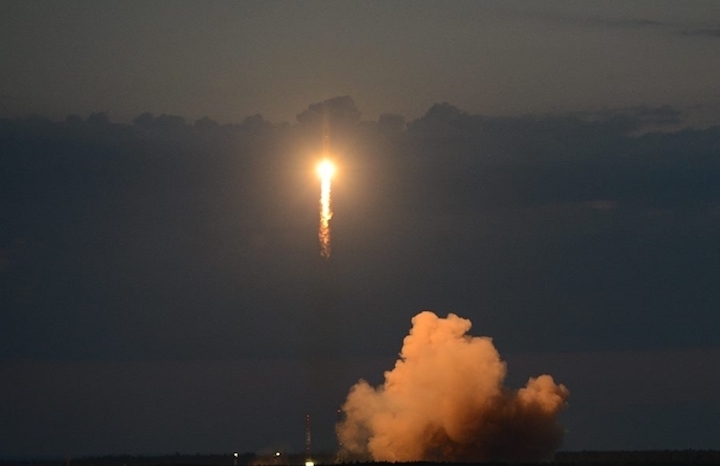 Russia has launched a replenishment satellite for its GLONASS navigation system Sunday, with a Soyuz-2-1b rocket and its Fregat-M upper stage carrying the Uragan-M No.756 spacecraft into orbit. Soyuz lifted off from the Plesetsk Cosmodrome at 00:30 Moscow Time (21:30 UTC). Following checkout and commissioning, the new satellite will bring the GLONASS system back up to full strength, enabling it to once again provide full worldwide coverage. A Russian analogue to the US Global Positioning System, and more recently Europe’s Galileo and China’s Beidou, GLONASS was developed by the Soviet Union beginning in the 1970s. GLONASS uses a constellation of satellites in medium Earth orbit (MEO) to broadcast navigation signals. Like other satellite navigation systems, GLONASS works by broadcasting precise timing signals which a receiver can use to calculate how long a signal took to reach it – and therefore how far away the satellite is. Using orbital ephemeris, also broadcast by the satellites, to determine their exact positions, the receiver can use the distances to four different satellites to triangulate its position. Each spacecraft in the GLONASS constellation broadcasts four L-band navigation signals: restricted-access L1 and L2 signals for the Russian military, and equivalent unrestricted signals for civilian applications. The GLONASS system requires 24 satellites across three orbital planes to enable continuous worldwide service. A minimum of eighteen satellites are required to provide coverage of just Russia and its territories. Named Uragan – meaning Hurricane – these satellites are manufactured by ISS Reshetnev (formerly NPO Prikladnoi Mekhaniki) with each current-generation Uragan-M spacecraft designed to provide seven years of service. Uragan-M spacecraft are three-axis stabilised and deploy twin solar panels to provide power once on orbit. Each 1,415-kilogram (3,120 lb) satellite carries caesium atomic clocks for accurate timekeeping. The Soviet Union’s deployment of GLONASS began in October 1982, with the launch of a single Uragan satellite and two mass simulators aboard a Proton-K rocket with a Blok DM-2 upper stage. Launches in the 1980s and late 1990s built up the GLONASS constellation, which reached initial operational capability with coverage of Russia in 1993, and full worldwide capability in 1996. Under Russian control after the collapse of the Soviet Union in 1991, GLONASS began to fall into disrepair in the late 1990s, as older spacecraft failed faster than new ones could be launched. By 2001 only ten satellites were serviceable. Following a 1999 directive from Russian President Boris Yeltsin, the second-generation Uragan-M spacecraft were developed to enable Russia to rebuild and upgrade the constellation. Vladimir Putin also took a personal interest in the project after becoming President in 2000. The first Uragan-M was launched in December 2001, accompanied by two first-generation spacecraft. Compared to its predecessors, the Uragan-M offers an increased timing frequency by a factor of five, as well as introducing the civilian L1 signal that was not provided by the first-generation spacecraft. With Uragan-M, the service life of GLONASS satellites also increased from three to seven years. While Uragan-M spacecraft continue to launch, Russia has been moving its focus to the next-generation Uragan-K spacecraft. Two Uragan-K1 prototypes were launched, in 2011 and 2014, with the second prototype now being used as part of the operational GLONASS constellation. Uragan-K1 spacecraft were originally to have served purely as prototypes, with the upgraded Uragan-K2 being used for operational satellites, however additional K1 satellites were ordered after the planned introduction of Uragan-K2 slipped to 2020. The next Uragan-K1 launch is expected towards the end of 2018. The Uragan-M No.756 satellite aboard Sunday’s launch is a replacement for Uragan-M No.734, in slot five of the constellation’s first plane. No.734 – which is also known as Kosmos 2458 – is one of three satellites that were launched aboard a Proton-M/DM-2 rocket in December 2009 and reached the end of its design life in 2016. This satellite is to be replaced following an outage earlier this year, however it is expected to remain in service as an on-orbit spare. Uragan-M satellites can be launched individually aboard Soyuz-2-1b rockets, or in trios atop the more powerful Proton-M. Both rockets require an upper stage to transport the satellites into their operational medium Earth orbits – with Soyuz using a Fregat-M and Proton the Blok DM-03. Sunday’s launch used the Soyuz-2-1b/Fregat-M combination and flew from the Plesetsk Cosmodrome in northwest Russia. Soyuz-2-1b is an evolution of the Soyuz rocket that was designed by Sergei Korolev, itself based on the earlier Voskhod rocket and ultimately the R-7 missile. R-7, which first flew in 1957, was the world’s first intercontinental ballistic missile and a modified version of the rocket was used to launch the first satellite, Sputnik, later the same year. The current generation of Soyuz rockets consist of the Soyuz-2-1a, a modernised version of the previous-generation Soyuz-U incorporating upgraded engines and digital avionics; Soyuz-2-1b, which uses an RD-0124 third stage engine to increase performance; and the lightweight Soyuz-2-1v which eliminates the rocket’s first stage and re-engines the second with and NK-33 motor to reduce the cost of launching smaller payloads. Soyuz-2-1b first flew in December 2004 deploying France’s CoRoT exoplanet detection satellite. Sunday’s launch was its thirty-ninth mission, including thirteen launches as Soyuz-STB, a modified version optimised to fly from Arianespace’s Centre Spatial Guyanais (CSG) launch site at Kourou, French Guiana. In its thirty-eight launches before Sunday’s, Soyuz-2-1b had achieved thirty-five successes. Launch failures in 2011 and 2017 resulted in the loss of the Meridian No.15L and Meteor No.2-1 satellites respectively. Another anomaly in 2014, involving a Soyuz-STB/Fregat-MT, placed two of Europe’s Galileo navigation satellites into an incorrect orbit. Reliability has been a concern for Russia’s space programme over the last few years, with a high number of failures attributed to faults in the manufacturing and quality control processes. Sunday’s launch took place from Site 43/4 at the Plesetsk Cosmodrome. One of four launch pads at Plesetsk built to support operational deployment of the R-7A missile in the 1960s, Site 43/4 is currently the only Soyuz launch pad in use at the Cosmodrome. Two other pads – 43/3 and 16/2 – are undergoing renovations that will see them take on a share of launches in the near future. Soyuz rockets can also launch from the Baikonur Cosmodrome – which has two Soyuz launch complexes – from the new Vostochny Cosmodrome and from Kourou, French Guiana. The launch began with ignition of the Soyuz rocket’s first and second stage engines, about sixteen seconds ahead of the planned liftoff. Under the stage numbering system used by Russia, the Soyuz is a three-stage vehicle with the rocket’s core considered the second stage and the four liquid-fuelled boosters that burned in parallel are its first stage. The boosters are powered by RD-107A engines, while the core stage sports an RD-108A, which is a closely-related development. The core and boosters, as well as the rocket’s third stage, consumes RG-1 propellant – a refined form of petroleum similar to the Western RP-1 – oxidised by liquid oxygen. After ignition, the engines ramped up to full thrust before Soyuz lifted-off. The first and second stages burned alongside each other for a little under two minutes, before the first stage boosters burned out and separated – making a pattern named the Korolev Cross after the rocket’s chief designer. Soyuz’ second stage continued to burn through first stage separation, cutting off 170 seconds later. Between these two events – likely about 45 seconds after first stage separation – the payload fairing was also jettisoned from the nose of the rocket, exposing Uragan-M No.756 to space for the first time. Shortly before second stage cutoff, the rocket’s Blok-I third stage ignited to begin its four-and-a-half-minute burn. Powered by an RD-0124 engine, the third stage brought the Uragan-M satellite close to orbital velocity before cutting off and separating from the Fregat-M, which is continuing the satellite’s journey. Fuelled by unsymmetrical dimethylhydrazine (UDMH) and dinitrogen tetroxide, Fregat-M’s restartable S5.98M engine will make a series of burns during Sunday’s mission, initially completing its insertion into a parking orbit before raising Uragan-M No.39 into its planned circular 19,100-kilometre (11,900-mile, 10,300-nautical-mile) orbit, inclined at 64.77 degrees. Spacecraft separation is expected several hours after launch. Sunday’s is the first replenishment launch for GLONASS since last September – further Uragan-M satellites are expected to fly aboard Soyuz-2-1b rockets in July and October. The launch comes ten days after an older Soyuz-FG rocket was used to carry three cosmonauts into space aboard the Soyuz MS-09 spacecraft, while the next flight of a Soyuz rocket is currently scheduled to be made by a Soyuz-2-1a on 9 July, with the Progress MS-09 resupply craft bound for the International Space Station.